I Bury the Living. Now that’s a hell of a title for a horror film--evocative and straight to the point, just the way I like them. Throw in the fact that it was directed by cult producer/director Albert Band, and this 1958 offering is nothing if not intriguing. Sometimes it just takes simple things like this for a film to separate itself from the horde of unwatched films sitting on the DVD shelf. This approach is a bit of a crapshoot, but it does kind of take me back to the days where I’d head down to a rental store and pick a movie based solely on such criteria. Give me some cool cover art (in this case, a seemingly undead person near an opened grave) and a fun tagline (“people are dying to get into this place!”), and I’m hooked. Robert Kraft (Boone) has recently become the chairman of a committee who oversees the upkeep of a large cemetery. In fact, it’s so large that the office houses a colossal map that keeps track of all the grave sites. White pins on the map designate reserved graves, while the black pins indicate that the plot is already occupied. On Robert’s first day, a newlywed couple stops by and morbidly informs him that they need to reserve their gravesites in order to cash in the groom’s inheritance. Without thinking, Robert casually marks the newly claimed gravesites on the map with black pins instead of white ones; it’s a seemingly harmless mistake until the couple ends up dead in a car accident! It seems like just an eerie coincidence until Robert keeps managing to turn the trick. This is a film with a pretty good hook in its premise; it kind of reminds me of something like “The Monkey’s Paw” in the sense that Robert’s seemingly harmless actions have deadly results. It’s just a good, spooky little tale with a naturally creepy setting in the cemetery. Much of the action takes place there, and it sets the mood well. As ridiculous as the story involving the newlyweds’ plot is, there’s still something oddly unsettling about the idea. It should be the happiest day of their lives, yet here they are staking claim to their final resting place. When we quickly find out that the couple has died, it’s kind of poignant and reminds us that death can come when you least expect it. There’s a true Twilight Zone-type vibe to the story, and the film actually predates that landmark show by a couple of years. As good as the set-up is, however, the story becomes more and more flawed as it wears on. Once Robert's “power” is obvious, it seems unlikely that he’d keep using it the way he does, especially considering how anguished he is every time he unwittingly kills everyone. There’s also the ending, where everything is finally explained and revealed. I won’t give it away, but I will say it’s disappointing and makes the story even more flawed. Everything that happens in the film suddenly doesn’t make a whole lot of sense, nor does the explanation even seem possible or at all logical. It’s a shame because there’s a lot to like in the general premise, especially when Kraft decides to reverse his trick: what happens when he switches black pins for white pins? You’ll have to see the film yourself to find out, but it is disappointing in the end. There’s a little bit more to like, though, that keeps the film watchable throughout. Boone’s performance is typical “leading man” stuff for the era: he’s likeable, and he’s a generally confident, strong-jawed type until his world begins to unravel. He makes his experience seem pretty hellish once that happens because he’s in obvious agony over his unwanted “talent.” Folk singer Theodre Bikel shows up as the cemetery caretaker, and he too is charming and likeable. He kind of reminded me of a less insane Groundskeeper Willie for most of the film, though it is a bit eerie the way he’s always chiseling names into graves. Band’s direction also captures some other moments of that sort: the map itself seems almost sentient, as its design resembles two eyes peering into you. Band also makes use of some surreal montage techniques and other visual effects to highlight the madness of the situation. This keeps it from being a simple point and shoot affair, and even though the big reveal is disappointing, the climax after that is pretty riveting and feels like something out of a Poe story. Also notable is Gerald Fried’s vintage monster movie score; Fried would go on to score such television shows as Star Trek and Mission: Impossible. 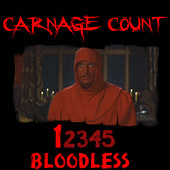 It’s a score that adds to the overall ambience, which is just about all the film has going for it in the end. A little bit of style and a great premise are unraveled by the film’s script, which trades in the film’s supernatural slant for something much more mundane. 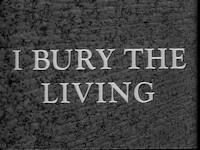 Luckily, I Bury the Living is available on dozens of public domain sets. I suppose you would call MGM’s “Midnite Movies” release of the film a more official release. It features a full-frame transfer that’s solid enough--it’s very clear, and the black and white tones are reproduced well. The mono soundtrack is mostly fine, though some of the dialogue gets a bit tough to hear at times. I imagine it’s the best way to watch the film, and, even though that release is out of print, it’s still very cheap. If you’ve got this one kicking around on a public domain release already, it’s probably safer to go that route. Save it for a rainy day, then unbury it. Rent it!